Sweden's Skogen have returned with a new recording which shows the music going into more of a folk inspired form of atmospheric black metal and this is a review of their 2018 "Skuggoka Kallar" which will be released in May by Nordvis. A very dark yet heavy sound starts off the album along with some clean pagan style vocals a few seconds later while the riffs also use a great amount of melody as well as all of the musical instruments having a very powerful sound to them and after awhile grim black metal screams start to make their presence known. Atmospheric synths can also be heard at times while the solos and leads are done in a very melodic fashion along with some folk instruments also being added into some parts of the songs as well as all of the music sticking to either a slow or mid paced direction and they close the album with two tracks that are very long and epic in length. On this recording Skogen adds more folk music influences into their atmospheric style of black metal, the production sounds very professional while the lyrics are written in a mixture of Swedish and English and cover Nature and Nordic Mythology themes. 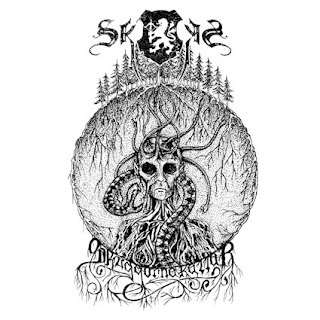 In my opinion this is another great sounding recording from Skogen and if you are a fan of folk music inspired atmospheric black metal, you should check out this album. RECOMMENDED TRACKS INCLUDE "Det Nordiska Morket" "Frostland" and "Beneath The Trees". 8 out of 10.